I’m strangely wired, as human beings go. I’ve faced a lot of adversity on a personal level, from tragic loss, abuse and bullying in childhood to homelessness, divorce and financial ruin as an adult. But I believe it’s how we work through these challenges in our lives that ultimately defines us. In the end, they either bring us to our knees or teach us how to fly. Though I was shy and somewhat timid as a kid, I’ve evolved into a person who never shies away from adversity. Instead, I tend to plant my feet, lower my shoulders and confront it head-on. 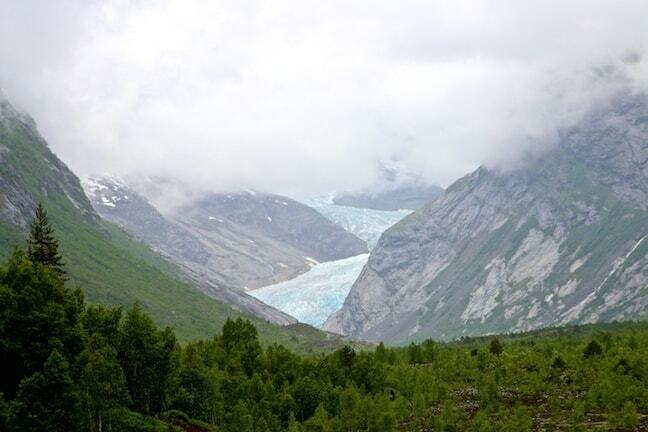 So when I saw the foreboding blanket of storm clouds rolling in over Norway‘s Nigardsbreen glacier (an arm of Jostedalsbreen, the largest glacier in continental Europe), I steeled myself for a cold, rainy day of climbing. 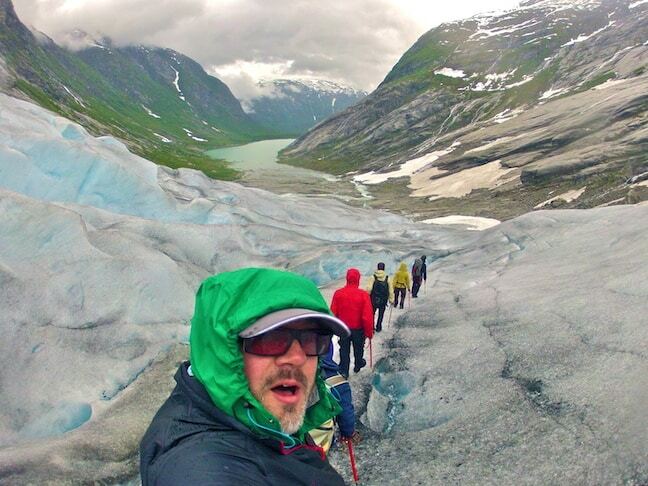 We rendezvoused with our IceTroll guide, Matias Cofone, at the Breheimsenteret Glacier Centre in Jostedal. Matias, an Argentinian who has been guiding glacier hikes for eight years, gave us an overview of safety procedures, briefly explained how we’d spend the next 7 hours of our day, and loaded us into a van for the short drive to the shore of Nigardsbrevatnet, the lake on which we would kayak to the base of the glacier. By this point the rain had built from a slow, steady drizzle to a sodden downpour. Even with two hooded jackets and multiple shirts layered beneath, the dismal weather brought a chill that penetrated to our bones as we paddled our way towards the glacier. I could feel Mary tensing up long before we reached the opposite shore. But the view around us was spectacular: The glacial silt lent an aquamarine milkiness to the water, complementing the evergreen trees lining the mountains that surrounded us. 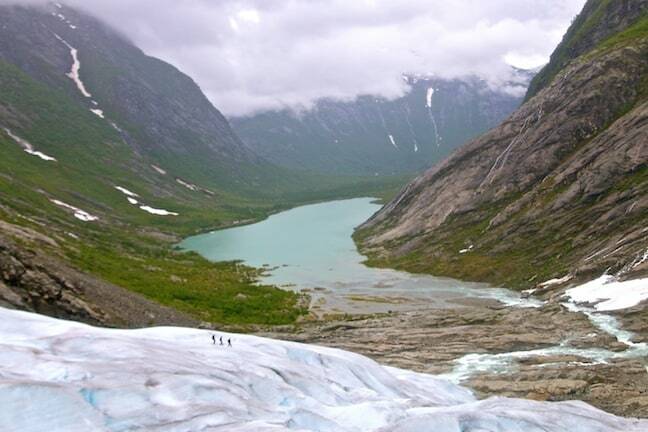 The rain created hundreds of waterfalls barreling down sheer cliffs that led to the lake, while the black and blue ice of Nigardsbreen loomed increasingly large before us. 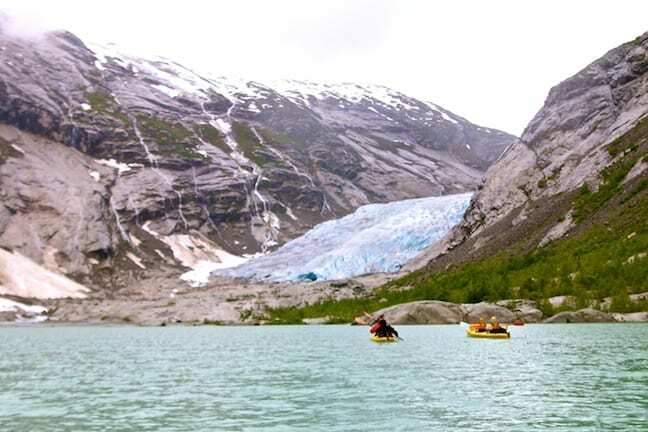 After beaching our kayaks we hiked to the base of the glacier, scrambling over rocks slick with rain and algae, climbing stairs, crossing swinging rope bridges over rushing rapids, and walking across two-by-fours stretched to ford shallow creeks. Matias showed us how to strap ourselves into our crampons and clipped us into the climbing ropes that would bind the 6 people on our team together. Sensing Mary’s growing sense of nervousness, I suggested we remain at the back of the pack, which would also give us extra time to take photos and video while we climbed. It was an exhilarating but challenging climb. The early summer temperatures had melted the glacier enough that you could hear water running off it. 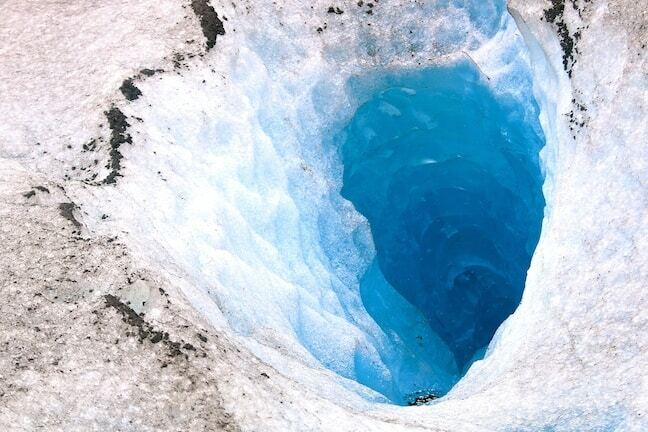 Massive crevasses of the deepest blue surrounded us. The rain and wind picked up as we traversed narrow ridgelines, pelting our faces and making the hard-packed ice slippery. Matias proceeded cautiously, stopping often to figure out the best route and making sure everyone in our group had a chance to catch their breath. The higher we climbed, the more I sensed Mary’s fear building: She had a death grip on her ice axe, and began to whisper nervously about wanting to turn back. Sensing we were getting near the top, I encouraged her to keep going, distracting her with the need to hydrate and the breathtaking view below us. Finally, we reached the top of a particularly intense section. 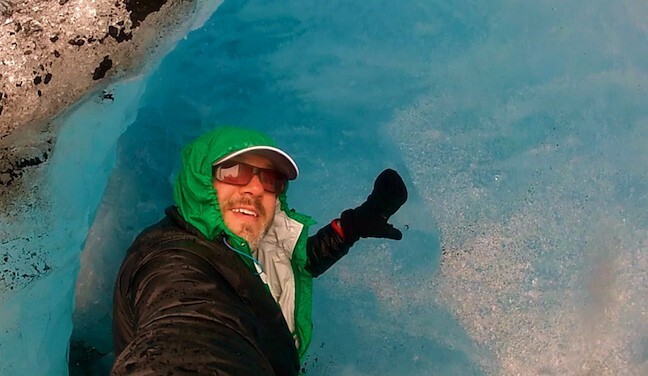 Matias shrugged off his backpack and stuck his ice axe in the wall of a sheer cliff of ice. There were sighs of relief all around as we took off our packs and unclipped ourselves from the rope for a brief lunch break, complete with hot cocoa Matias had brought in a thermos. Look Ma, I’m in an Ice Cave! Of course I wanted, but most of the other climbers declined. 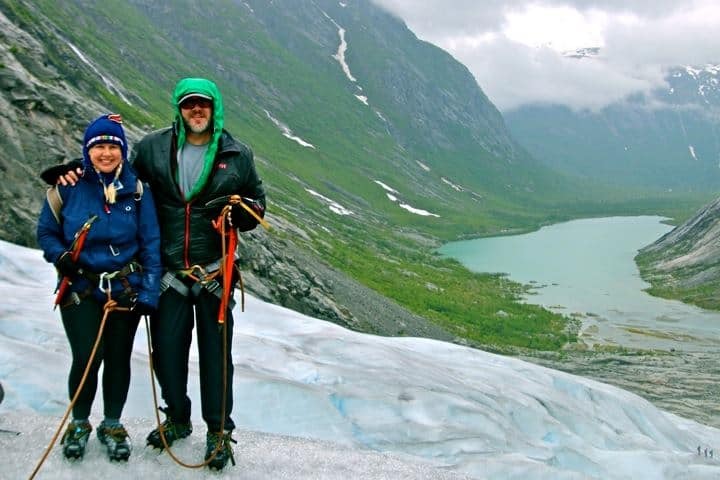 Mary was clearly delighted to be on solid ground, not having to straddle a crevasse, climb steep sections of ice or balance precariously on a ridge for a few minutes. I almost felt guilty for loving the adventure as much as I did. But not so guilty that I stopped grinning like the Cheshire Cat in every photo. Eventually we strapped ourselves back into our packs, clipped into our ropes, and began one last push towards the summit. But as we came around a corner and met up with another group of climbers descending, Matias and one of the other guides began talking, pointing in the direction we were headed. Matias looked concerned, and asked us to gather around for a chat. In the end, we’d climbed only a few hundred meters in all. But for us– with the steep inclines, bad weather and our inexperience– it might as well have been Mount Everest. 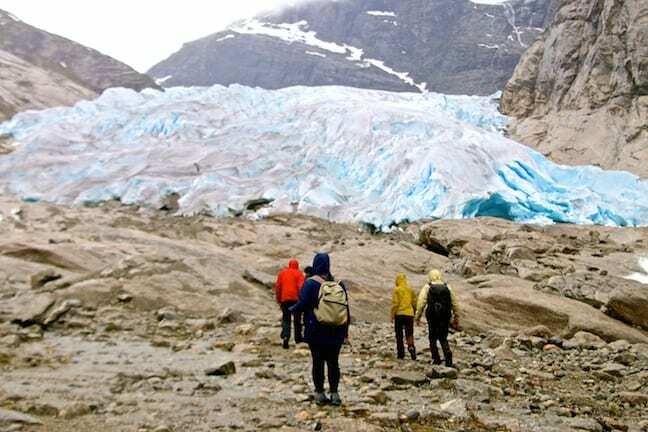 Though Nigardsbreen has been described as one of the most easily accessible glaciers in the world, it’s also dangerous and should never be attempted without an experienced guide. 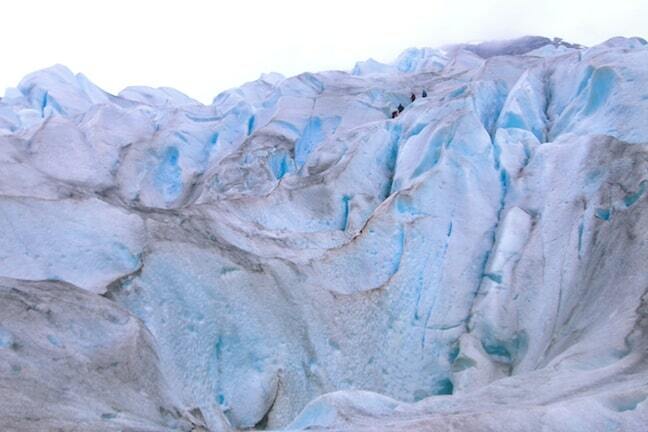 A couple from Germany died there in August 2014 when the glacier began calving (breaking apart) after they’d crossed cautionary ropes set up at the base of the glacier. There’s no better word than “EPIC” to describe Norway, and our day climbing Nigardsbreen was one of our most epic adventures to date. As the sun finally emerged from between the clouds, we were filled with a huge sense of accomplishment for rising to Mother Nature’s challenges.